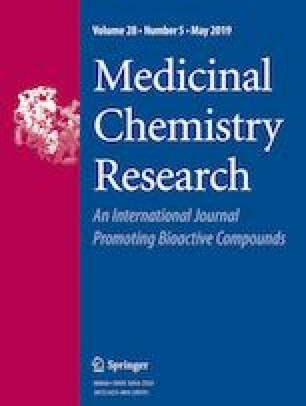 Series of novel chromonyl enaminones 1a–e and 2a–e and 3-alkylated chromones 3a–e were synthesized and evaluated in vitro as α-glucosidase inhibitors as well as antioxidant and antifungal agents. Antifungal activity was tested on strains of Candida albicans. Compounds 2a and 2d–e showed good inhibition of the α-glucosidase enzyme (IC50 = 5.5, 0.9, and 1.5 mM, respectively), their effect being better than that of 1a–e, 3a–e, and acarbose (the standard, IC50 = 7.73 ± 0.9 mM). The structure–activity relationship suggests that the phenyl group at the C-3 position of the chromone ring system and the 4-chlorophenyl group at the enaminone moiety (derivatives 2) increased the inhibition of α-glucosidase. Compounds 2a–e exhibited a slight antioxidant effect, and compounds 3a–e a moderate antifungal activity against C. albicans (IC50 70.5–83.1 µg/mL). Docking studies revealed that compounds 2 interact with the α-glucosidase residues of the binding pocket. Therefore, these chromone derivatives may be considered as potential α-glucosidase inhibitors, as well as antifungal agents against some Candida strains of yeast. The online version of this article ( https://doi.org/10.1007/s00044-019-02320-w) contains supplementary material, which is available to authorized users. The authors thank Carlos Espinoza-Hicks for help in spectrometric measurements and Bruce A. Larsen for proofreading. J.T. acknowledges financial support from the Secretaría de Investigación y Posgrado, Instituto Politécnico Nacional (SIP-IPN) (grants 20090326, 20100236, 20110172, 20120830, 20130686, 20140858, 20180198, and 20195228) and CONACYT (grants 83446 and 178319). For financial support, F.D. is grateful to SIP-IPN (grants 20170925, 20181332, and 20195287) and J.C.-B. to CONACyT (CBB-254600 and APN-782). A.M.-M. and C.R.-E. thank CONACYT for the graduate scholarships awarded (178319 and 264517) and SIP-IPN (BEIFI) for a complementary scholarship. This work was financially supported by a project from SIP-IPN (20170430, 20181433, 20195786). F.E.J.-M. (20160247), M.C.C.-L. (20160206), F.D., and J.T. are fellows of the Estímulos al Desempeño de los Investigadores (EDI-IPN), and M.C.C.-L., F.D., and J.T. are fellows of the Comisión de Operación y Fomento de Actividades Académicas (COFAA)-IPN.